The purpose of the three studies in this dissertation was to enhance career and technical education in the area of agriculture, business, and family and consumer sciences. 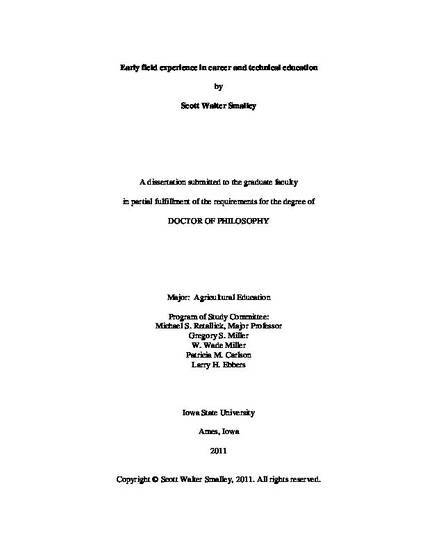 This dissertation contains three papers: (1) a Delphi study identifying the purpose, expected outcomes, and methods of documenting preservice teacher early field experience (EFE) activities in agricultural teacher education programs; (2) a national descriptive study describing agricultural teacher education early field experience (EFE) practices using the EFE Model; and (3) a national descriptive study describing business, and family and consumer sciences teacher education early field experience (EFE) practices using the EFE Model. For all studies an early field experience (EFE) was defined as all field experiences that occur prior to student teaching and the experiences could be offered within or outside of the agricultural education curriculum. Programs required minimum number of contact hours and minimum number of lessons to be taught while in the field. The most commonly identified student assessments included: the university supervisor's review of documents, cooperating teacher signatures, reflective writing, and student journaling. The studies supports the career and technical education profession by identifying differences and similarities in EFE programming in an effort to provide a more congruent EFE experience for preservice teachers. All three studies can be used to modify and improve EFE in career and technical education in the area of agriculture, business, and family and consumer sciences. The studies will aid the profession in providing a more congruent EFE experience for preservice teachers.